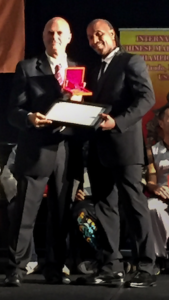 Sifu Slaughter was inducted into the ICMAC Hall of Fame on June 30, 2018. This award recognizes Sifu Slaughter’s dedication and many contributions to Chinese martial arts, as well as his, and his school’s, consistent participation and volunteer work with the ICMAC tournaments over the past 20 years. The ICMAC, under the direction of Master Nick Scrima, established the Hall of Fame for masters and grandmasters as part of its 20th year anniversary celebrations, with the initial inductions taking place at the ICMAC Orlando tournament on June 30, 2018.